Welcome to the fourth GfK radio survey results of 2018. All the GfK results and #1’s are available below, to bring you up to speed quickly. Radio Today will continue its rolling ratings coverage throughout the day, including The Spin. 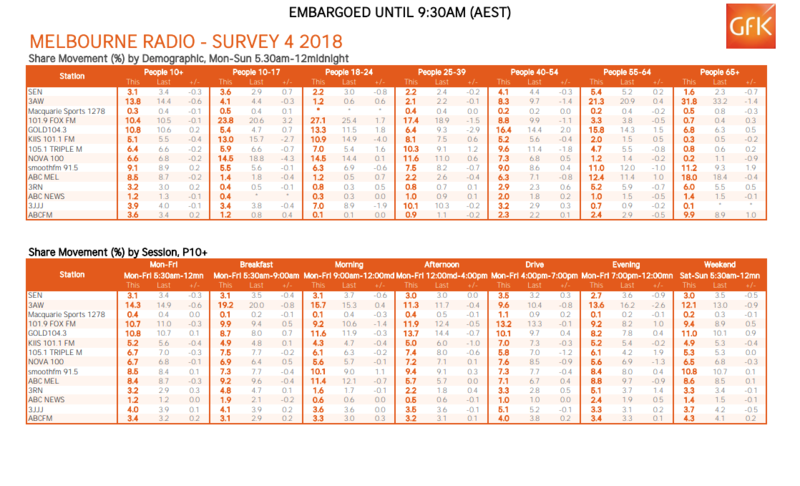 Survey four for 2018 was conducted by GfK for Commercial Radio Australia between Sunday April 22 and Saturday June 30. On the FM band, KIIS 106.5’s Kyle and Jackie O continue their stronghold at Breakfast as we hit the halfway point of 2018. It was another great result for Australian Radio Network’s WSFM today too (+1.0), remaining #1 FM with 10.7% of People 10+. Not so great news for Southern Cross Austereo’s 2DayFM or Triple M, both stations experienced overall dips, echoed also in their Breakfast and Drive programs. In fact, triple j’s Ben and Liam are now ahead of Em, Grant and Ed. It’s worth noting that KIIS FM’s Will and Woody are facing a challenge in Drive as well, losing listeners (-1.2) for a second consecutive book. 2GB’s Alan Jones remains the city’s king of talkback, holding an impressive 16.6% share of the Sydney audience (+1.3). 2GB also enjoyed a notable rise (+1.3) to end survey four on 14%. Sister station Macquarie Sports Radio, as expected, lost more ears this book (-1.1); they are now below one point on 0.8%. All eyes were on Christian O’Connell for his first book on ARN’s Gold104.3 Breakfast, which proved a success with an upward swing (+0.7) in audience share to 8.7%. Gold remains #1 FM of People 10+. It wasn’t enough to topple SCA’s Fox FM from the top of the Breakfast tree though, as Fifi, Fev & Byron rise to an impressive 9.9% (+0.5) on Breakfast. Fox’s Hughesy and Kate also remained steady and in the lead on FM Drive with 13.2% (-0.1). 3AW continues its unbridled dominance on AM despite a slip to 13.8% of People 10+ (-0.6) and small downward swings on Breakfast and Drive. Macquarie Sports Radio remained steady overall, on 0.3% share (-0.1). 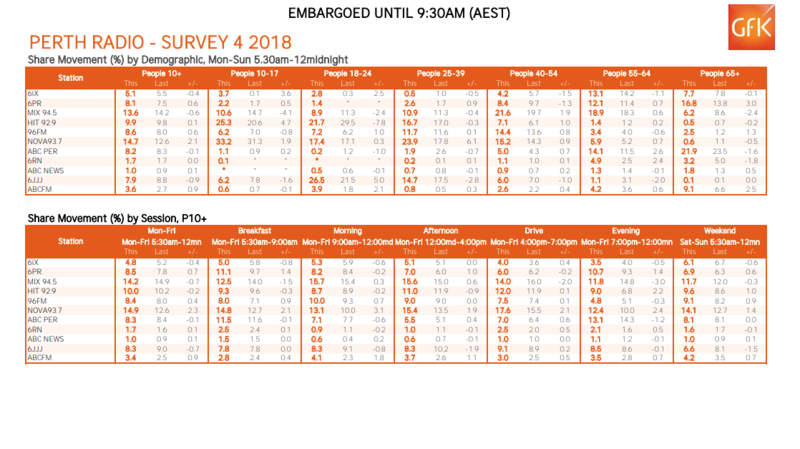 Nova 106.9 emerged from Survey 4 as the clear market leader, despite slipping to 12.2% of People 10+ (-0.8), benefitting from an even bigger slip by 97.3FM to 11.9% (-0.1). The battle for Brisbane Breakfast remains just as tight as the previous survey, with 0.2 points separating Hit105’s Stav, Matt & Abby steady on 12.5% from leaders Ash Kip & Luttsy with Susie O’Neil on 12.7% (+0.1). Over on AM and Brisbane is now the Macquarie Sports Radio’s only market rating above one point, with a rise to 1.1% of People 10+ (+0.6). Overall though, 4KQ kept hold of the #1 spot on AM, up to 9.9% overall (+0.9), however ABC’s Craig Zonca and Rebecca Levingston are still topping Breakfast with 9.1%. 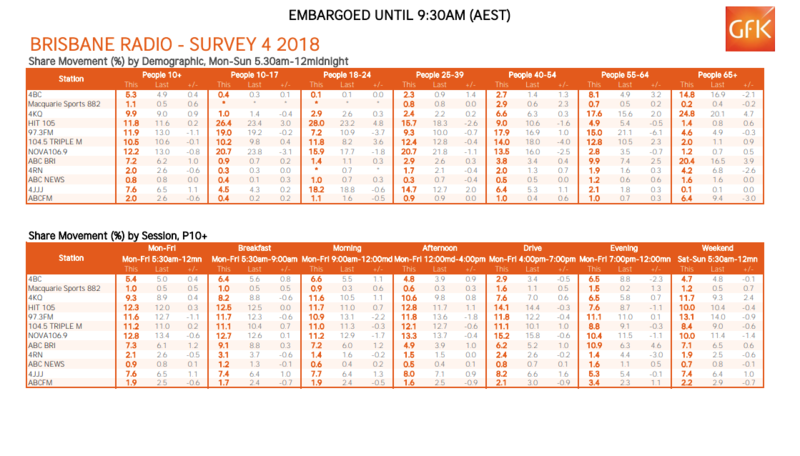 FiveAA comfortably took out the AM band, with a strong gain to finish on 11.8% overall for People 10+ (1.4), whilst also remaining #1 on Breakfast and Drive as well. 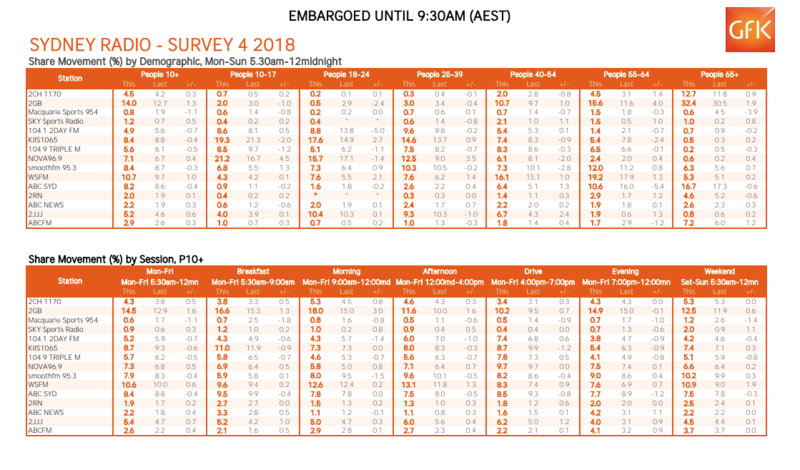 ABC Adelaide dropped across all three metrics, falling to 9.7 overall (-1.7), to 13.5% on Breakfast (-2.1) and to 7.0% at Drive (-2.5). It’s a good news story for NOVA Entertainment in Perth today, with Nova 93.7 returning to #1 with a station record of 14.7%, and the most listeners in the history of Perth radio with 607,000 listeners. 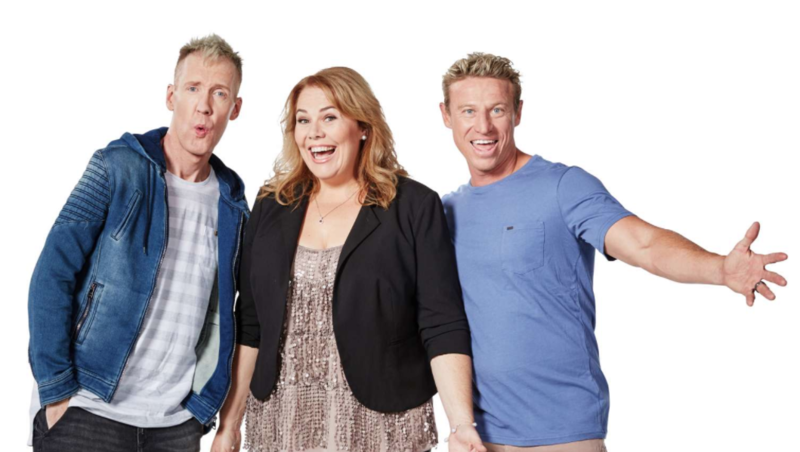 Nathan, Nat & Shaun are Perth’s #1 Breakfast show on 14.8% (+2.1). When it comes to radio ratings, every station’s win is another station’s loss. Mix 94.5 slipped slightly in People 10+ (-0.6) to #2, following by Hit92.9 (+0.1), 96FM (+0.6) and triple j (-0.9). Macquarie Media will be pleased to see some audience lift at 6PR. The station is up in People 10+ (+0.6), Breakfast (+1.4) and fairly steady in Drive (-0.2). For the Australian Broadcasting Corporation, it was a pretty flat book for ABC Perth, Radio National and ABC News. Looks like 2DAYFM commercial free hasn’t worked for them. More Em on breakfast we miss her.